We are a family run wholesaler based in Windermere delivering in a 70 mile radius with fresh, ambient and frozen foods to the catering industry. After more than 70 years we still have the same passion and drive to deliver good quality service to our customers. Job Purpose To provide a 1st Class customer service to all our customers whilst responsible for the processing of orders received by phone, email and fax. along with resolving customer concerns and complaints by effectively liaising with relevant colleagues to reach resolution in line with McClures' customer service policy. Proactively engaging with existing customers to promote our products and customer service. Key Accountabilities To receive inbound sales and customer telephone calls, capturing all information accurately and timely. To create and input customer order requirements into the order management system accurately and timely. Periodically make outgoing sales calls to existing our customer base, promote to customers product’s on promotion, to meet departmental KPI’s. To take responsibility for the receipt, control and communication of customer complaints, providing appropriate guidance and support through the process to a successful resolution. To identify customer service needs and always strive for exceeding expectations, whilst operating in a culture of continuous improvement. To lead, encourage and maintain, high levels of communication with all departments within the company, in the drive for customer satisfaction. To maintain account information and undertake general office administration. To assist within alternative departments where the Business requires, maintaining a flexible approach to functionality and hours required. To have an understanding of the wider Business and how current role influences operations. To be responsible for maintaining McClures' health and safety standards. Person Spec Our existing Customer Service Team members are shining examples of how to look after people. They have an acute eye for detail, are quick thinkers, hard workers and deliver first class customer service. 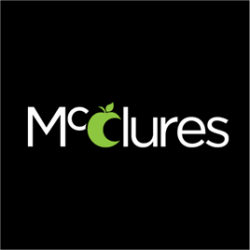 They’d love an extra pair of hard-working hands to join them at the front line of the McClures' customer experience. We are looking for candidates that can operate under tight time constraints, multi-tasking by means of receiving customer orders by phone/voicemail, inputting in to a data system along with providing key advice and potentially alternative approaches to the customer needs. You will be able to manage workloads and increase the pace dependant on the call flow from our customers. All of this will be handled with a high level of professionalism and care for our customers. You will ideally have had experience in a call centre environment or fast paced customer facing role. Knowledge of the catering trade and products used within would be a distinct advantage as we sell products to hotels, cafes, restaurants and bars etc. You will also have had previous experience with the use of computer systems and inputting into expansive database profiles. You will have a generally high level of literacy and numeracy. This position is for our Late Shift team and will comprise of working 5 days out of 6. Part-Time hours are available but will include Friday and Sunday evenings. Job Purpose To provide a 1st class service to all our customers whilst being responsible for the delivering of orders throughout Cumbria, Lancashire & Yorkshire. Proactively engaging with existing customers to ensure satisfaction. Key Accountabilities The timely and accurate delivery of goods to customers. To follow customer instructions as to delivery point and follow any reasonable customer requests. To communicate any customer concerns to relevant department in order to maintain high levels of communication between all departments. To receive cash payments from customers and hand to accounts. To maintain accurate account information through point of delivery paperwork, recording any credit given and reason why. To perform and keep accurate vehicle and temperature check records using established company systems. To keep vehicle clean and hygienic, suitable for food transportation. To assist within alternate departments where business requires, maintaining a flexible approach to functionality and hours required. To have a wider understanding of the company ethos and values. To be responsible for maintaining McClures' health and safety standards. Person Spec Our existing distribution team really deliver! They have an acute eye for detail, are quick thinkers and deliver first class customer service. They’d love an extra pair of hard-working hands to join them at the front line of McClures. We are looking for candidates that have multi drop delivery driving experience for 7.5 ton vehicles. You will be smart and courteous at all times always going the extra mile for customer satisfaction. If applying for this position, a drivers CPC and digi-tacho card are required. Knowledge of the catering trade and products used within would be a distinct advantage as we sell products to hotels, cafes, restaurants and bars etc. You will also have good local geographical knowledge. You will have a generally high level of literacy and numeracy. Job Purpose To provide a 1st class service to all our customers whilst being responsible for the delivering of orders throughout Cumbria, Lancashire & Yorkshire. Proactively engaging with existing customers to ensure satisfaction. Key Accountabilities The timely and accurate delivery of goods to customers. To follow customer instructions as to delivery point and follow any reasonable customer requests. To communicate any customer concerns to relevant department in order to maintain high levels of communication between all departments. To receive cash payments from customers and hand to accounts. To maintain accurate account information through point of delivery paperwork, recording any credit given and reason why. To perform and keep accurate vehicle and temperature check records using established company systems. To keep vehicle clean and hygienic, suitable for food transportation. To assist within alternate departments where business requires, maintaining a flexible approach to functionality and hours required. To have a wider understanding of the company ethos and values. To be responsible for maintaining McClures' health and safety standards. Person Spec Our existing distribution team really deliver! They have an acute eye for detail, are quick thinkers and deliver first class customer service. They’d love an extra pair of hard-working hands to join them at the front line of McClures. We are looking for candidates that have multi drop delivery driving experience for 3.5 ton vehicles. You will be smart and courteous at all times always going the extra mile for customer satisfaction. Knowledge of the catering trade and products used within would be a distinct advantage as we sell products to hotels, cafes, restaurants and bars etc. You will also have good local geographical knowledge. You will have a generally high level of literacy and numeracy. Job Purpose To provide a 1st class service to all our customers, whilst responsible primarily for the accurate order assembly of catering goods orders for next day dispatch. Key Accountabilities The timely and accurate assembly of orders to catering trade. Using a very keen eye for detail. To follow instructions as defined on picking list, using good stock rotation and general good housekeeping techniques. To communicate any concern to relevant dept. in order to maintain high levels of communication between all departments. To ensure all picked orders fulfil our and our customer's high quality standards. To maintain accurate stock control by updating pick locations on an adhoc basis. To load vehicles safely and considerately using load sheet on “last on, first off basis”. To help keep the high standards of general housekeeping and cleanliness needed in a food warehouse. To assist within alternate departments where business requires, maintaining a flexible approach to functionality and hours required. To have a wider understanding of the company values and ethos. To be responsible for maintaining McClures' health and safety standards. Person Spec Our very busy lateshift / nightshift are looking to recruit a hardworking, conscientious person(s) with an acute eye for detail, who always go the extra go the extra mile for customer satisfaction. Previous experience of working in a warehouse environment on late evenings / nights is preferred. Knowledge of the catering trade and products used within would be a distinct advantage as we sell products to hotels, cafes, restaurants and bars etc. You will have a generally high level of literacy and numeracy. This position will comprise of working 5 days out of 6. Part-Time hours are available but will include Friday and Sunday. Email me jobs from W. McClure Ltd.